Pesticides play a vital role in increasing the yield of a harvest. With the commodities prices facing an all-time low and the market saturated with over produced of pesticides, the year 2017 will see an almost flat growth rate, which will pick up in 2018 due to the favorable weather conditions and other factors. The global pesticide market, which was highly fragmented previously will see a merger of the big players in the industry. The developed countries will look to utilize the products present in inventory, so the developing economies such as India, Brazil and as well as others have been identified as a potential market. Globally the market is predicted to grow at a CAGR of about 3.02% with Asia Pacific region showing the maximum growth. The factors that are driving the growth are increasing food demand and technological advances along with the presence of a highly effective operational and logistics network. The four major types of pesticides are herbicide, insecticide, fungicide and rodenticide, which form the base of the pesticide market, with herbicide covering around 42% of the market, followed by insecticides and herbicides respectively. Rodenticide market is very small compared to the other three types as it covers only 3% of the market. 11 major companies have been covered in this report for accurately studying the market and understanding the need of the market, and to determine the growth drivers and inhibitors and trends followed in the pesticide market. •This report provides a detailed view of Global Pesticide Market. •This report identifies the need for pesticides. 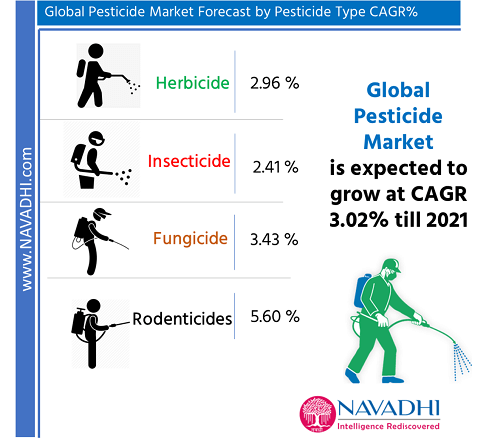 •This report provides detailed information on Pesticide market with growth forecasts up to 2021. •The report identifies the growth drivers and inhibitors for Pesticide market in world. •This report profiles top eleven manufacturers related to global Pesticide market. 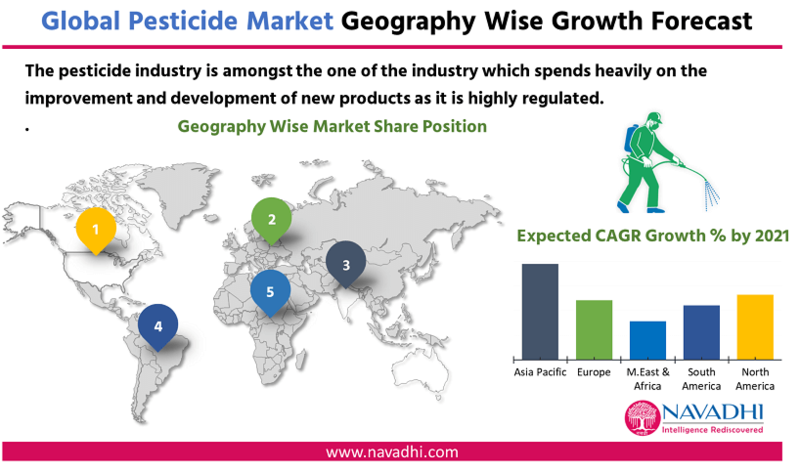 •This report provides detailed competitive landscape of global Pesticide market. •This report identifies major challenges faced by a new player in global Pesticide market. •The report identifies the key risks associated with global Pesticide market. •This report provides future trends for Global Pesticide Market. •This report also provides recommendations for policy makers and investors and helps other players sustain in this market. 7.2 ADAMA Agricultural Solution Ltd.
7.2.3 Financial Performance of ADAMA Agricultural Solution Ltd.
7.2.5 SWOT Analysis for ADAMA Agricultural Solutions Ltd.
7.3.3 Financial Performance of Nufarm Ltd.
7.3.5 SWOT Analysis for Nufarm Ltd.
7.4.3 Financial Performance of Bayer AG. 7.4.5 SWOT Analysis for Bayer AG. 7.5.3 Financial Performance of Syngenta AG. 7.7.5 SWOT Analysis for FMC. 7.8.3 Financial Performance of DuPont. 7.8.5 SWOT Analysis for DuPont. 7.9.5 SWOT Analysis for Dow Agro Sciences. 7.10.3 Financial Performance of Sumitomo Chemical Company, Limited. Exhibit 7.2.1 Company Profile – ADAMA Agricultural Solution Ltd.
Exhibit 7.2.2 Contact Details – ADAMA Agricultural Solution Ltd.
Exhibit 7.2.8 Major Products and Services of ADAMA Agricultural Solution Ltd.
Exhibit 7.2.9 SWOT Analysis of ADAMA Agricultural Solution Ltd.
Exhibit 7.3.1 Company Profile – Nufarm Ltd.
Exhibit 7.3.2 Contact Details – Nufarm Ltd.
Exhibit 7.3.8 Major Products and Services of Nufarm Ltd.
Exhibit 7.3.9 SWOT Analysis of Nufarm Ltd.
Exhibit 7.4.2 Contact Details – Bayer AG. Exhibit 7.11.1Company Profile – Rallis India Limited. Exhibit 7.11.2 Contact Details – Rallis India Limited.